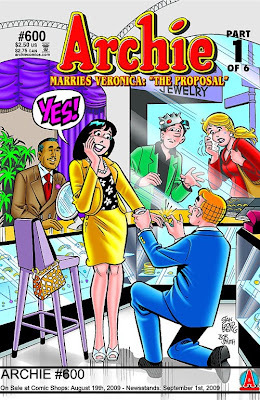 Archie's proposing to Veronica!?! NOOOOOOOOOOOO!!!!!!!!!!!!!!!!!!! I've been a major Archie comics collector and fan and collector since the tender age of 11 and somehow lost interest when I entered university. Well who didn't! The storyline dragged on forever! The main plot roaming around the love triangle between Archie, Betty, and Veronica. Once Archie wanted Betty and other times Veronica! Nothing new and I as a reader got pretty bored and I kind felt old to read the comics aimed for teenagers. I was the Betty at my school and we used to name kids in our class by the characters! Those were the days. So you can guess how pissed I am with the news of Archie proposing to Veronica instead of Betty. That's a slap to my face! I got the news in an email sent by their website (I don't even remember subscribing to their emails!). And so I had this nostalgic urge to subscribe to the issues holding the shocking storyline. Seriously, I want to know what the hell happened! That's Archie #600 and will be the first of six parts. Its the wedding of the century and its on sale NOW. Oh my goddddd!! So cannot believe that! WHAT??? NoWaaaaaaaaaaaaaay, so missed a lot!